Noble gases serve as unique tracers of the origin and evolution of Earth’s volatile reservoirs owing to their inert nature and contribution from extinct and extant radioactivities. However, noble gases are low in abundance relative to many other elements, particularly in the Earth’s mantle. Additionally, mantle-derived samples show large post-eruptive atmospheric contamination, rendering the determination of the primary mantle composition challenging. The sources of mantle krypton and xenon remain debated due to their partially resolvable excess, if any, relative to the atmosphere. Atmospheric noble gases also appear to be recycled into the mantle via subduction, progressively overprinting the initial mantle signature. Here we develop a new protocol to accumulate non-contaminated mantle-derived xenon, in particular the low abundant 124-126-128Xe. The results show the highest excesses in 124-126-128Xe ever measured in the mantle relative to the atmosphere and point toward a chondritic origin for mantle xenon. The fissiogenic isotopes 131-132-134-136Xe allow the onset of efficient xenon recycling in the mantle to be constrained at around 3 Gyr ago, implying that volatile recycling before 3 Ga would have been negligible. Figure 1 Light xenon isotopic compositions for popping rock 2πD43. Measured data (blue dot) and corrected data for atmospheric contamination (orange dot) with a 129Xe/130Xe ratio of 7.6: (a) 126Xe/130Xe and (b) 128Xe/130Xe versus 124Xe/130Xe. 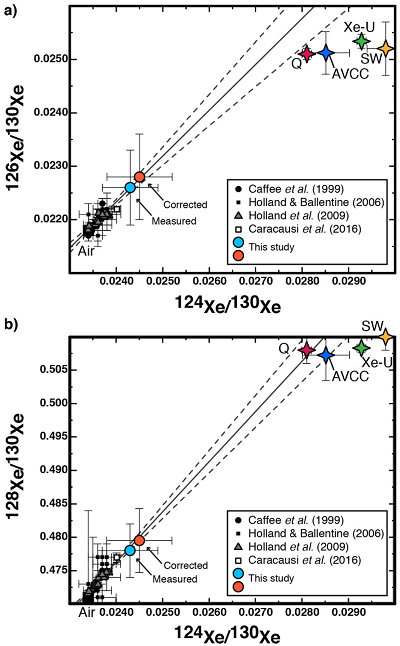 For comparison, data of CO2 well gases from Caffee et al. (1999) (black points), Holland and Ballentine (2006) (black square) and Holland et al. (2009) (grey triangles), and thermal springs from Caracausi et al. (2016) (green square) and Moreira et al. (2018) (red square) are shown. The solid line is a fit of the data, except that of Holland and Ballentine (2006). The dotted lines indicate the 95 % confidence interval. Phase Q (Busemann et al., 2000), Solar Wind SW (Meshik et al., 2014), Xe-U and AVCC (Pepin, 2003). These new data suggest a chondritic origin (Phase Q or AVCC) for upper mantle Xe. Figure 2 Heavy xenon isotopic compositions for popping rock 2πD43. Measured data (blue dot) and corrected data for atmospheric contamination (orange dot) with a 129Xe/130Xe ratio of 7.6: (a) 131Xe/130Xe and (b) 134Xe/130Xe versus 132Xe/130Xe. Data for sample 2πD43 from Kunz et al. (1998), for CO2 well gases from Caffee et al. (1999) (black points), Holland and Ballentine (2006) (black square), and thermal springs from Caracausi et al. (2016) (green square) and Moreira et al. (2018) (red square) are shown. The trends of pure 244Pu- and 238U-derived xenon productions are also indicated. The source of sample 2πD43 seems to be more influenced by Pu-derived Xe than U-derived Xe, contrary to other MORBs (Tucker et al., 2012; Parai and Mukhopadhyay, 2015). Figure 3 Determination of the maximum average age of recycled atmosphere in the mantle. The evolution of the xenon atmospheric composition is represented with the blue dashed line with the numbers indicating the time in Gyr (a power law was considered; Bekaert et al., 2018). The corrected data for shallow atmospheric contamination is shown (light blue dot). 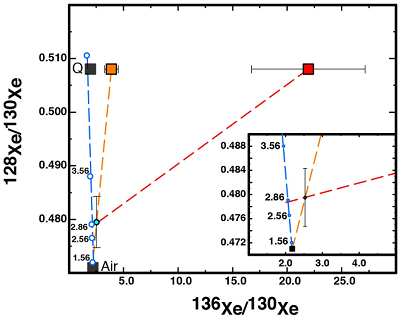 The minimum (3.9 ± 0.6 (1σ); orange square) and maximum (21.9 ± 5.2 (1σ); red square) 136Xe/130Xe ratios in the mantle before recycling of atmospheric xenon are calculated considering mixing with air (orange and red dashed lines) and that the initial 128Xe/130Xe is chondritic (Phase Q; Busemann et al., 2000). The red line suggests that recycling of atmospheric xenon could have been effective only since 2.8 ± 0.3 (1σ) Gyr ago. Otherwise, unreasonable values of 136Xe/130Xe ratios are obtained. Parai, R., Mukhopadhyay, S. (2015) The evolution of MORB and plume mantle volatile budgets: Constraints from fission Xe isotopes in Southwest Indian Ridge basalts. Geochemistry, Geophysics, Geosystems 16, 719-735. Parai, R., Mukhopadhyay, S. (2018) Xenon isotopic constraints on the history of volatile recycling into the mantle. Nature 560, 223-227. Avice, G., Marty, B., Burgess, R. (2017) The origin and degassing history of the Earth's atmosphere revealed by Archean xenon. Nature Communications 8, 15455. Marty, B., Altwegg, K., Balsiger, H., Bar-Nun, A., Bekaert, D.V., Berthelier, J.J., Bieler, A., Briois, C., Calmonte, U., Combi, M., De Keyser, J., Fiethe, B., Fuselier, S.A., Gasc, S., Gombosi, T.I., Hansen, K.C., Hässig, M., Jäckel, A., Kopp, E., Korth, A., Le Roy, L., Mall, U., Mousis, O., Owen, T., Rème, H., Rubin, M., Sémon, T., Tzou, C.Y., Waite, J.H., Wurz, P. (2017) Xenon isotopes in 67P/Churyumov-Gerasimenko show that comets contributed to Earth's atmosphere. Science 356, 1069-1072. ). Indeed, 124-126-128-130Xe are non-radiogenic, stable isotopes whereas 129Xe is radiogenic (decay product of the now extinct 129I radioactivity) and 131-132-134-136Xe are fissiogenic, both deriving from the fission of the now extinct 244Pu nuclide (half life 80 Myr) and the still alive 238U nuclide. Parai, R., Mukhopadhyay, S., Standish, J.J. (2012) Heterogeneous upper mantle Ne, Ar and Xe isotopic compositions and a possible Dupal noble gas signature recorded in basalts from the Southwest Indian Ridge. Earth and Planetary Science Letters 359-360, 227-239. Pető, M.K., Mukhopadhyay, S., Kelley, K.A. (2013) Heterogeneities from the first 100 million years recorded in deep mantle noble gases from the Northern Lau Back-arc Basin. Earth and Planetary Science Letters 369–370, 13-23. Poreda, R.J., Farley, K.A. (1992) Rare gases in Samoan xenoliths. Earth and Planetary Science Letters 113, 129-144. Trieloff, M., Kunz, J., Clague, D.A., Harrison, D., Allègre, C.J. (2000) The Nature of pristine noble gases in mantle plumes. Science 288, 1036-1038. Trieloff, M., Kunz, J., Allègre, C.J. (2002) Noble gas systematics of the Reunion mantle plume source and the origin of primordial noble gases in Earth's mantle. Earth and Planetary Science Letters 200, 297-313. Moreira, M., Rouchon, V., Muller, E., Noirez, S. (2018) The xenon isotopic signature of the mantle beneath Massif Central. Geochemical Perspectives Letters 6, 28-32. ), so that when samples are crushed, this air component mixes with mantle gases from intact bubbles, rendering determination of Xe anomalies even more difficult if not impossible. Burnard, P., Graham, D., Turner, G. (1997) Vesicle-specific noble gas analyses of "popping rock": implications for primordial noble gases in the Earth. Science 276, 568-571. ). The new protocol consists of sequential crushing steps, with the neon composition of each step being used as a monitor of post-eruptive atmospheric contamination, as Ne displays distinct atmospheric and mantle compositions (20Ne/22Ne ratios of 9.8 and 12.5 respectively). If the 20Ne/22Ne ratio is higher than 11.8, then the heavy noble gases from each crush step are accumulated on activated charcoal (Fig. S-1 and Supplementary Information). ). The measured xenon isotopic ratios are hence corrected for this limited atmospheric contamination (17 %), assuming that the uncontaminated 129Xe/130Xe ratio is 7.6 (Table S-1) and the two data (measured and corrected) are indicated in Figure 1. The high measured 129Xe/130Xe ratio (7.41) allows checking that the new protocol is very efficient for determining the mantle xenon composition with almost no atmospheric contamination (Fig. S-2). Busemann, H., Baur, H., Wieler, R. (2000) Primordial noble gases in "phase Q" in carbonaceous and ordinary chondrites studied by closed-system stepped etching. Meteoritics and Planetary Science 35, 949-973. Pepin, R.O. (2003) On Noble Gas Processing in the Solar Accretion Disk. Space Science Reviews 106, 211-230. ). These new data suggest a chondritic origin (Phase Q or AVCC) for upper mantle Xe. Avice, G., Marty, B., Burgess, R., Hofmann, A., Philippot, P., Zahnle, K., Zakharov, D. (2018) Evolution of atmospheric xenon and other noble gases inferred from Archean to Paleoproterozoic rocks. Geochimica et Cosmochimica Acta 232, 82-100. Bekaert, D.V., Broadley, M.W., Delarue, F., Avice, G., Robert, F., Marty, B. (2018) Archean kerogen as a new tracer of atmospheric evolution: Implications for dating the widespread nature of early life. Science Advances 4, doi: 10.1126/sciadv.aar2091. ). The data corrected for shallow atmospheric contamination (Fig. 1 and Table S-1) is considered in a 128Xe/130Xe vs. R space, where R represents the ratio of one fissiogenic Xe isotope (131,132,134,136Xe/130Xe; Fig. 3). The corrected fissiogenic data are thus extrapolated to an initial chondritic (Phase Q) 128Xe/130Xe for the mantle, as the data in this contribution point to a chondritic origin, considering mixing with the atmosphere to determine the mantle R ratio before recycling. This mixing relationship is calculated for different air compositions through time (Fig. 3), with the minimum R ratio being obtained if only present day air has been recycled and the maximum ratio represents the scenario if only ancient air has been recycled (Figs. S-5, S-6 and Supplementary Information). ). The red line suggests that recycling of atmospheric xenon could have been effective only since 2.8 ± 0.3 (1σ) Gyr ago. Otherwise, unreasonable values of 136Xe/130Xe ratios are obtained. The maximum air-corrected mantle 131-136Xe/130Xe ratios (Figs. S-5, S-6) are determined for a recycling of air at 2.8 ± 0.3 (1σ) Gyr ago (Fig. 3). This represents a limit on the weighted average age of recycled atmosphere retained in the mantle. Ancient atmospheric gas could have been recycled but not enough to draw this average above 2.8 Ga, otherwise the slopes of the mixing lines between ancient air and the corrected data would be negative (Figs. 3, S-7). Dhuime, B., Hawkesworth, C.J., Cawood, P.A., Storey, C.D. (2012) A Change in the Geodynamics of Continental Growth 3 Billion Years Ago. Science 335, 1334. Harrison, T.M., Blichert-Toft, J., Müller, W., Albarede, F., Holden, P., Mojzsis, S.J. (2005) Heterogeneous Hadean Hafnium: Evidence of Continental Crust at 4.4 to 4.5 Ga. Science 310, 1947.
van Keken, P.E., Hacker, B.R., Syracuse, E.M., Abers, G.A. (2011) Subduction factory: 4. Depth‐dependent flux of H2O from subducting slabs worldwide. Journal of Geophysical Research: Solid Earth 116, B01401, doi: 10.1029/2010JB007922. Smye, A.J., Jackson, C.R.M., Konrad-Schmolke, M., Hesse, M.A., Parman, S.W., Shuster, D.L., Ballentine, C.J. (2017) Noble gases recycled into the mantle through cold subduction zones. Earth and Planetary Science Letters 471, 65-73. We wish to thank Rita Parai and an anonymous reviewer for their constructive comments that helped improving the paper as well as Cin-Ty Lee for editorial handling. We are also very grateful to Guillaume Avice and Edward Inglis for fruitful discussions on the first version of this manuscript. The authors acknowledge the Labex UnivEarthS for its financial support. S.P. also wants to acknowledge the financial support from the L’Oréal-UNESCO For Women in Science France 2017 fellowship. This is IPGP contribution number 3994. Among them, Xe with its nine isotopes is an ideal tracer of both volatile origin and mantle evolution because all of its isotopes represent distinct geochemical signatures (Kunz et al., 1998; Moreira et al., 1998; Caffee et al., 1999; Holland and Ballentine, 2006; Pujol et al., 2011; Mukhopadhyay, 2012; Tucker et al., 2012; Parai and Mukhopadhyay, 2015, 2018; Avice et al., 2017; Marty et al., 2017). Incorporation of atmospheric Xe into the mantle is further complicated by the fact that the Xe composition of the atmosphere has changed over time (Pujol et al., 2011; Avice et al., 2017, 2018; Bekaert et al., 2018), starting with the composition of the primordial U-Xe component (Pepin, 2003) and reaching the present day composition, enriched in heavy isotopes by about 40 per mille u-1 compared with U-Xe, around 2 Gyr ago (Avice et al., 2018). Xenon loss from the atmosphere to the outer space accompanied by isotopic fractionation could explain this evolution even if the physical process leading to this loss is still debated (Avice et al., 2018). A second issue surrounding the determination of 124-126-128Xe excess is that basaltic glasses are highly susceptible to post-eruptive contamination by air (Ballentine and Barfod, 2000). Typically air can enter glass samples and be hosted within small cracks and open vesicles (Ballentine and Barfod, 2000), so that when samples are crushed, this air component mixes with mantle gases from intact bubbles, rendering determination of Xe anomalies even more difficult if not impossible. First, the evolution of the Xe atmospheric isotopic ratios are derived based on a power law for the Xe fractionation factor (Bekaert et al., 2018). Figure 3 [...] The evolution of the xenon atmospheric composition is represented with the blue dashed line with the numbers indicating the time in Gyr (a power law was considered; Bekaert et al., 2018). To this end, the gas-rich popping rock 2πD43 sample is analysed, which has been extensively studied (Burnard et al., 1997; Kunz et al., 1998; Moreira et al., 1998). Figure 1 [...] Phase Q (Busemann et al., 2000), Solar Wind SW (Meshik et al., 2014), Xe-U and AVCC (Pepin, 2003). A linear fit through the data suggests a chondritic xenon composition (Phase Q, the main carrier of heavy noble gases in chondrites (Busemann et al., 2000) or AVCC for Average Carbonaceous Chondrites (Pepin, 2003)) for the initial mantle (Fig. 1) rather than Solar Wind. Many studies have focused on the radiogenic and fissiogenic Xe compositions of the Earth’s mantle from analyses of mid-ocean ridge basalts (MORBs) (Kunz et al., 1998; Moreira et al., 1998; Parai et al., 2012; Tucker et al., 2012; Parai and Mukhopadhyay, 2015), plume-influenced back-arc basin basalts (Pető et al., 2013), oceanic island basalts (OIBs) (Poreda and Farley, 1992; Trieloff et al., 2000, 2002; Mukhopadhyay, 2012), CO2 well gases (Caffee et al., 1999; Holland and Ballentine, 2006; Holland et al., 2009) and thermal springs (Caracausi et al., 2016; Moreira et al., 2018) because these isotopes are relatively abundant. The only successful attempts to resolve 124-126-128Xe excess have been during the analyses of CO2 well gases and thermal springs (Caffee et al., 1999; Holland and Ballentine, 2006; Caracausi et al., 2016). However, recycling of atmospheric xenon via subduction into the convecting mantle effectively overprints and erases the primitive mantle signature, as more than 80 % of Xe in the mantle is assumed to be derived through the subduction of oceanic lithosphere (Caffee et al., 1999; Holland and Ballentine, 2006; Mukhopadhyay, 2012; Parai and Mukhopadhyay, 2015). Figure 1 [...] For comparison, data of CO2 well gases from Caffee et al. (1999) (black points), Holland and Ballentine (2006) (black square) and Holland et al. (2009) (grey triangles), and thermal springs from Caracausi et al. (2016) (green square) and Moreira et al. (2018) (red square) are shown. Figure 2 [...] Data for sample 2πD43 from Kunz et al. (1998), for CO2 well gases from Caffee et al. (1999) (black points), Holland and Ballentine (2006) (black square), and thermal springs from Caracausi et al. (2016) (green square) and Moreira et al. (2018) (red square) are shown. Recycling of atmospheric Xe is required to explain the present day mantle 124-126-128Xe composition (Fig. 1) (Caffee et al., 1999; Holland and Ballentine, 2006; Mukhopadhyay, 2012; Parai and Mukhopadhyay, 2015; Caracausi et al., 2016). The contributions of each of these four components was deconvoluted in mantle-derived samples (Caffee et al., 1999; Mukhopadhyay, 2012; Tucker et al., 2012; Pető et al., 2013; Parai and Mukhopadhyay, 2015; Caracausi et al., 2016), in an attempt to determine the ratio of Pu- to U-derived Xe in mantle sources and so better constrain their degassed states, a higher Pu- to U-derived Xe ratio reflecting a less degassed source due to the fact that 244Pu is now extinct. Therefore, results from previous studies (Caffee et al., 1999; Mukhopadhyay, 2012; Tucker et al., 2012; Pető et al., 2013; Parai and Mukhopadhyay, 2015; Caracausi et al., 2016) may be biased and may not precisely estimate the ratio of Pu- to U-derived Xe in the mantle. A chondritic origin of mantle Xe (Caracausi et al., 2016) and Kr (Holland et al., 2009) was first suggested based on analyses of CO2 well gases and thermal springs. However, the excesses in 124-126-128Xe measured for the Eifel spring (Caracausi et al., 2016) remain questionable given that strong atmospheric contamination is needed to explain the Eifel heavy Xe pattern (Moreira et al., 2018) (131-136Xe; Fig. 2). Either it is consistent with studies that showed that subduction on Earth started around 3 Gyr ago (e.g., Dhuime et al., 2012), or subduction started earlier (e.g., Harrison et al., 2005) but volatile recycling was only efficient from 3 Ga. Figure 1 [...] The solid line is a fit of the data, except that of Holland and Ballentine (2006). It is however not possible to distinguish between Phase Q and AVCC, contrary to the suggestion that mantle Kr and Xe were derived from material similar to AVCC (Holland et al., 2009). 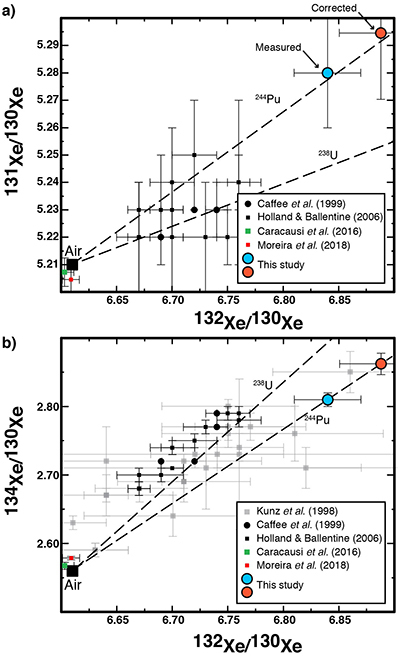 Initial studies measured the abundances of 124-126-128Xe in mantle-derived samples but proved these to be unresolvable from that of the atmosphere (Kunz et al., 1998). Comets would not have contributed significantly to mantle xenon contrary to atmospheric xenon (Marty et al., 2017, and discussion below). The U-Xe component was first theoretically suggested to explain the Xe isotopic pattern of the atmosphere (Pepin, 2003) and measurements of Xe in comet 67P/C-G reveal that U-Xe could be a mixture of chondritic and cometary volatiles (Marty et al., 2017). The 129Xe/130Xe ratio of the accumulated gas is 7.41 ± 0.03 (1σ), showing limited atmospheric contamination. Indeed the upper mantle 129Xe/130Xe ratio is assumed to be 7.6 based on previous popping rock 2πD43 data (Moreira et al., 1998). Figure 2 [...] The source of sample 2πD43 seems to be more influenced by Pu-derived Xe than U-derived Xe, contrary to other MORBs (Tucker et al., 2012; Parai and Mukhopadhyay, 2015). The new data shown in Figures 2 and S-4 suggest that the source of the popping rock 2πD43 is more heavily influenced by Pu-derived Xe than U-derived Xe, contrary to other MORBs (Tucker et al., 2012; Parai and Mukhopadhyay, 2015). In the latter case, the delayed efficient recycling of volatiles could be related to the secular cooling of the Earth as it was suggested that noble gases and other volatiles such as water would mainly be recycled into the mantle through cold subduction zones (van Keken et al., 2011; Parai and Mukhopadhyay, 2015; Smye et al., 2017), while it is likely that early subduction was dominated by hot slabs (van Keken et al., 2011). A recent study modelled the xenon isotopic composition of the mantle taking into account degassing and regassing with an evolving xenon atmospheric composition and found that xenon recycling would have been significant after 2.5 Gyr ago (Parai and Mukhopadhyay, 2018). This result is consistent with the mantle evolving to a net regassing regime after 2.5 Ga (Parai and Mukhopadhyay, 2018). Consequently it has long been assumed that anomalies of 124-126-128Xe were undetectable in basaltic glasses (Trieloff et al., 2000).